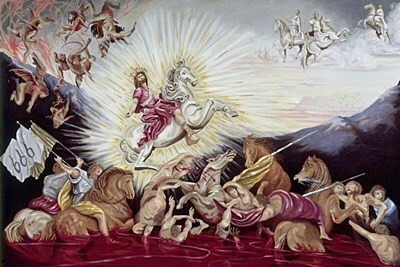 After the marriage of the Lamb, the apostle John presents the opening of heaven and the majestic appearance of Jesus Christ upon a white horse (Rev 19:11). Jesus is described with a fearful physical appearance which emphasized His divine purpose of carrying out His Father's judgment (Rev 19:12-15). Assisting Jesus Christ, in carrying out God's judgment, are the unfallen angels in heaven (Rev 19:14, 17-18; Matt 13:41-42). So decisive was the military victory that the Antichrist and False Prophet were seized without having any time to escape and were justly tossed into the lake of fire (Rev 19:20-21). In view of God's wrath being final (Rev 15:1), the angel told to reap the earth (Rev 14:18-19), and the angel standing in the sun calling upon the birds to feed upon "the flesh of all men, both free men and slaves, and small and great" (Rev 19:21), it appears that all of humanity left on earth is destroyed. Satan himself does not escape, and is sealed and imprisoned in the abyss for one thousand years (Rev 20:1-3).